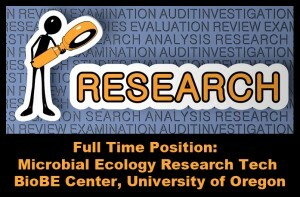 Microbial Ecology Research Tech position at BioBE Center, University of Oregon – microBEnet: the microbiology of the Built Environment network. 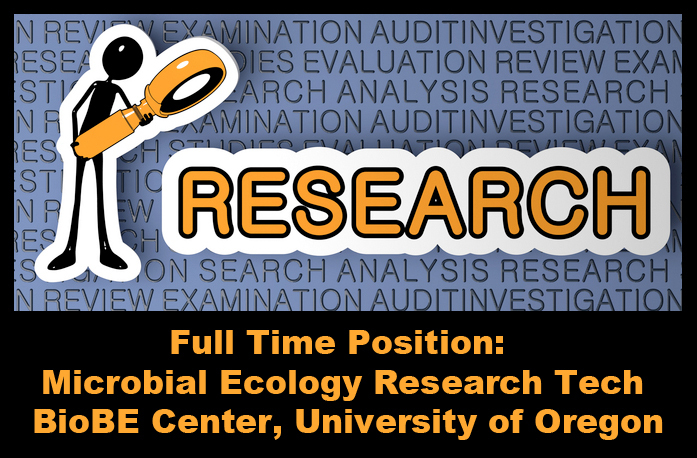 The Institute of Ecology and Evolution at the University of Oregon currently has an opening for a full time Research Assistant to work in the area of microbial ecology. The successful candidate will play a key role in the Biology and Built Environment (BioBE) Center (http://biobe.uoregon.edu/), funded by the Alfred P. Sloan Foundation. The BioBE Center is training a new generation of innovators to study the built environment microbiome – the diversity of indoor microbial life, their genetic elements and their interactions. The vision of this national research center is to understand buildings as complex ecosystems and to explore how architectural design mediates urban microbial ecology and evolution. For a description of partner projects see http://www.microbe.net/. Extensive experience using molecular techniques is required, including some combination of skills in DNA/RNA extraction, PCR, cloning, next-generation DNA sequencing, bioinformatics, and phylogenetic analysis. Ability to work in a team atmosphere is a must. A Master’s degree in biology is desirable, but individuals with a bachelor in biology or related field and extensive experience are also encouraged to apply. The successful candidate will be responsible for conducting laboratory research under the direction of Jessica Green and Brendan Bohannan.